Barbecues are very popular at this time of the year and these simple chicken skewers are the perfect recipe for the barbecue. 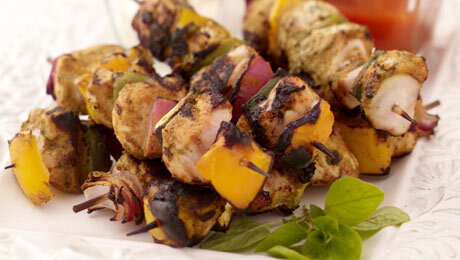 The yoghurt marinade works wonderfully and the skewers will be a wonderful addition to your barbecue repertoire. Cut the chicken, peppers, courgette and red onion into large chunks. Thread the chicken and vegetables onto barbecue skewers (I normally use metal skewers. If you are using wooden skewers soak them in advance in cold water). Place the finished skewers into a baking dish. Mix together the yoghurt, curry powder, thyme, lime zest & juice and pour this over the chicken skewers. Mix well to ensure they are all coated with the marinade. Place the marinated chicken skewers on the barbecue and cook for 3-4 minutes per side, ensuring that the chicken is well cooked through before serving. Barbecues vary so much that the cooking times may vary so you need to ensure that the chicken pieces are fully cooked through before serving.